Whiskas Anti Hairball Treats have been specially developed to help reduce hairball formation by up to 66%. Hairballs are a common problem in 65% of household cats, caused by naturally over grooming and skin irritations. These irresistible, soft centred, crunchy treats can be used as a supplement for regular cat food, containing ingredients which help clear and move the hair through the intestine, declining the irritation of hair balls. Feed up to 10 pieces per day. 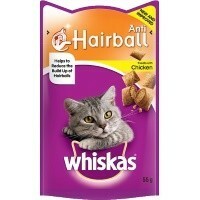 These are a great treat as my cat loves them, and they do her a favour by preventing hair balls. She has that very fine "under" coat hair and these seem to work as she hardly ever coughs up hair.